When it does snow, we talk a lot about the snow on Mauna Kea as it’s more accessible (and perhaps more visible) from the main populated areas on the Big Island. 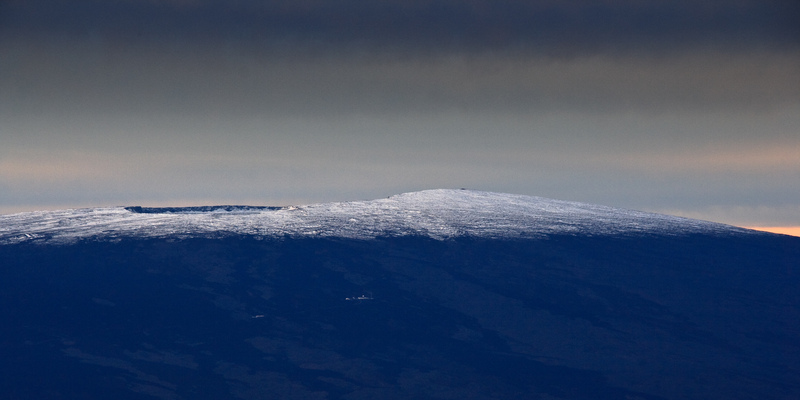 However, Mauna Loa also gets a decent sprinkling of snow as this picture shows (taken last week). Sunrise or sunset? I tried to get a shot of the Mauna Loa summit at sunset on a couple of evenings last week but the clouds and light made it very difficult – just not enough contrast. Hi Tom – this was sunrise. That’s what you’ve restricted me to, right? Given my schedule in January, I might have to revisit the deal! Seriously, it’s a great photo! One shot I want to get is Mauna Loa from the Mauna Kea access road – in some conditions when driving back down to Hilo you really see how big Mauna Loa is and I’d love to capture that in a photo one day. I think it’ll be tough assignment though.